The Alameda County District Attorney’s Office has issued criminal charges to four Nov. 9 protesters, documents show. UC Berkeley students Ricardo Gomez, Zakary Habash and Ramon Quintero and associate English professor Celeste Langan face several charges, including resisting arrest and remaining at the scene of a riot, according to county criminal dockets. In addition to the two charges the protesters have in common, they individually face other charges — including a charge against Habash for battery of a peace officer. Quintero, who also faces charges for obstruction of a public place, said in an email that the UC Berkeley Police Review Board — which held meetings earlier this week to investigate police use of force during the protest — has ignored his complaints against UCPD in the past. He added that he had not been notified of the charges. BAMN Attorney Ronald Cruz said that Yvette Felarca, a national organizer for BAMN, was also charged for “obstructing an officer and malicious blocking of a sidewalk or public thoroughfare” in a letter this weekend, though this has not been confirmed with the district attorney’s office. However, campus spokesperson Janet Gilmore stressed that the charges are not under the purview of the campus. 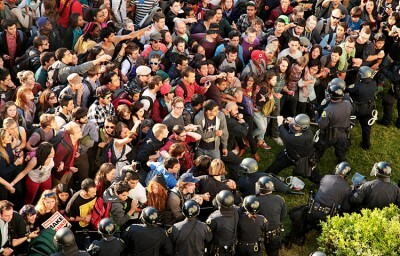 Judith Butler, faculty advocate for the protesters and professor of rhetoric and comparative literature, said in an email that the campus administration should emulate UC Davis Chancellor Linda Katehi, who requested that criminal charges be dropped for those arrested during UC Davis November protests. “It was an important step in recognizing that protest should be protected on campus, and should not be criminalized, especially when there is no harm to people or property,” Butler said in the email. Langan will be arraigned at 9 a.m. on March 16 at the Wiley W. Manuel Courthouse. Gomez, Habash and Quintero will be arraigned at 9 a.m. on March 21 at the same location.